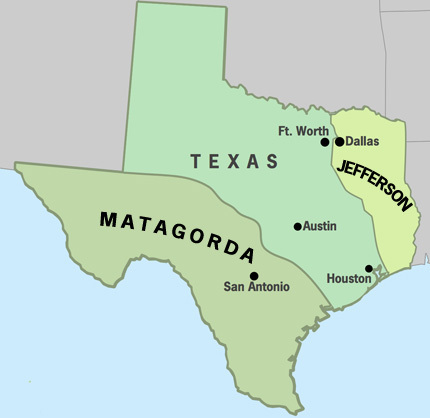 Forgotten secession: when the original 13 tried to split. 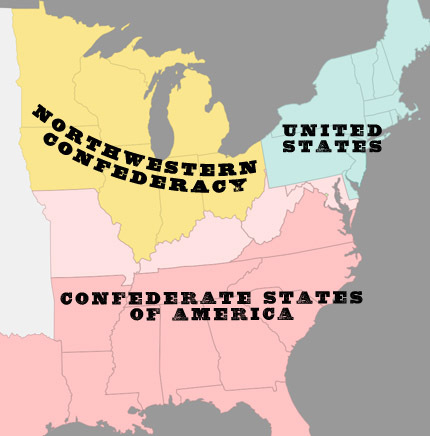 In 1812-13 there was a movement in the original thirteen states to secede from the rest of the nation—an idea first championed by a guy named John Lowell of Massachusetts. You have to admit there was some logic to this. 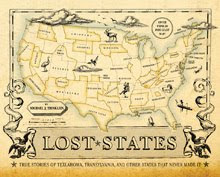 As the United States expanded, the original 13 states had less and less influence. Even a third grader can do the math: in the late 1700s, the two Massachusetts senators made up nearly 8 percent of the US Senate. Today, it's just 2 percent. Lowell thought his state had less and less control of its own affairs, so he advocated expelling the western states from the Union. The governors of both New York and Maryland liked the idea. Lowell laid out his argument in a tract with the less-than-snappy title: Thoughts in a series of letters, in answer to a question respecting the division of the states. By a Massachusetts farmer. The idea was popular in certain influential circles, but eventually it died out. Maybe if Lowell had come up with a more catchy title... like "Think Small." You can read more about it here or read all of Lowell's original tract here. 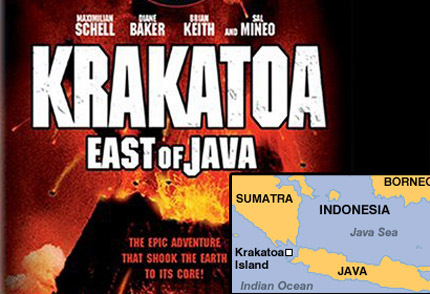 Worst geography blunder in a movie? "I don't get no respect" ...that was the catchphrase of comedian Rodney Dangerfield. And it might as well be the slogan of the new nation of South Sudan. 48 days after independence... and it's still not on Google Maps. These things take time, you might think. Not really. When rebel forces took control of Tripoli this week, Google changed names on its Libya map within hours. Yes, hours. But South Sudan is still waiting. There's an excellent article about all this at Mashable. 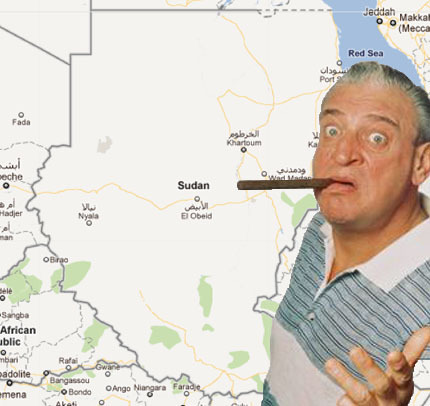 Maybe South Sudan should just change it's name to South Dangerfield. At least then it would get some attention. There's been a lot of criticism of Rick Perry's talk of Texas secession, but at least he's not giving his vacation dollars to a government that recently voted to secede—like President Obama is. 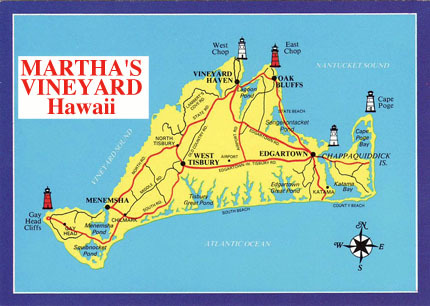 OK, it's a stretch, I admit... but it is kind of funny that Obama is vacationing on Martha's Vineyard—one of the only places in the north that actually voted in favor of secession. And it wasn't centuries ago... it was 1977. The people of Martha's Vineyard and Nantucket were so mad at Massachusetts, they actually voted to leave the state. 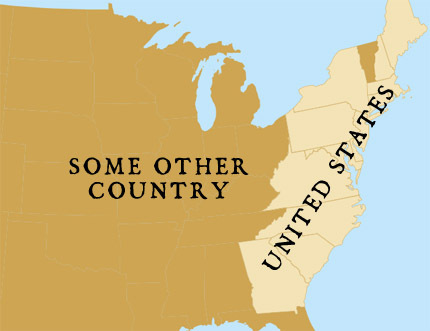 There was some talk of forming a new country, but most of the proposals had Nantucket and Martha's Vineyard joining Vermont. Or perhaps Hawaii. Yeah, Hawaii offered an invitation. Wait a minute, that's where Obama's from! Conspiracy theorists, start your engines! OK, nobody actually believes that President Obama sides with Martha's Vinyard's lingering secessionists. So if secession came up, on say, a political talk show, I'd expect Obama's spokespeople to deny any silly secessionist talk. Wait a second! Obama's campaign advisor Robert Gibbs can't seem to stop talking about secession! And press secretary Jay Carney is no better. Yes, I know they are poking at Perry, but it strikes me as odd to point the "He's a secessionist" finger when their man is actually staying on Secession Island. Hawaii became a U.S. state 52 years ago yesterday. One long-forgotten chapter in Hawaii's history is when the Russians tried to take control of the islands. Back in the early 1800s, Hawaii was a coveted port for whalers. So, in 1816, the Russians began building a fort on Oahu, hoping to control the islands. King Kamehameha I would have none of it, and forced them off the island without any bloodshed. But the Russians didn't go home. 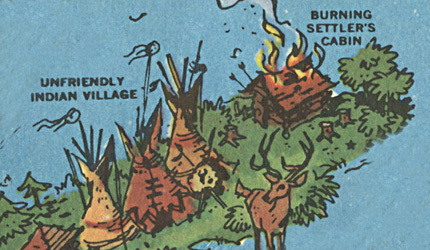 Instead, they tried to build their fort on nearby Kauai. When Kamehameha found out, he took more severe action—deporting the Russians to California. This ended Russia's plans in Hawaii, opening the door for the United States a few decades later. Labels: Fun map stuff, New states? I'm not going to write the name of this place, because I fear Google will put up some weird ads. Hey, this is a family-friendly site! Still, it's a real place in Macon County, Georgia—between Mooney Gap and Bearpen Gap. You have to admit that it's kind of funny that there is a place with that name. If fact there are several. 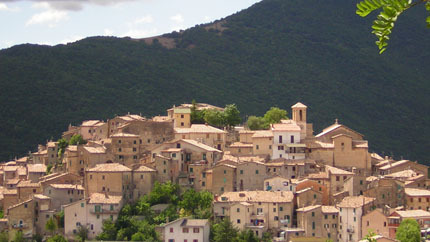 The term means an "abrupt, broken off end of a ridge or mountain." OK, sure. 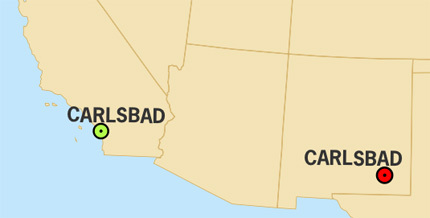 Your can read about this and other odd place names here. 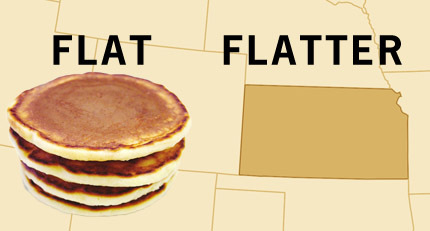 Is Kansas flatter than a pancake? Scientists at Arizona State and Texas State have focused considerable research energy on one of the great questions of our time: Is Kansas really flatter than a pancake? Of course, they used the standard measure of flatness: The length of an ellipse’s semi-major axis A is compared with its measured semi-minor axis B using the formula for flattening, f = (a – b) / a. Of course. Using a standard IHOP pancake, the team calculated a flatness of .957, which is flat, but shy of perfect flatness (which would be a 1.0). 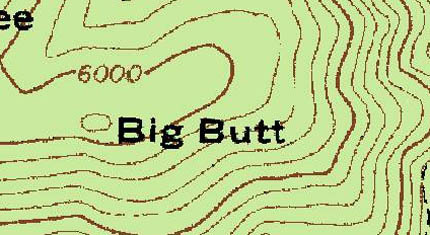 Applying the same formula to the topography of Kansas, the scientists came up with .9997, which is much much flatter than a pancake. So it's not really right to drive through Kansas and say, "This place is as flat as a pancake." However, if you ever went to IHOP and got a particularly flat pancake, you would be OK in saying, "This pancake is a flat as Kansas." Thank university scientists by Mark Fonstad, William Pugatch, and Brandon Vogt, for solving this vexing question. No one is likely to be surprised that Snooki from Jersey Shore is a bit of a dim bulb. 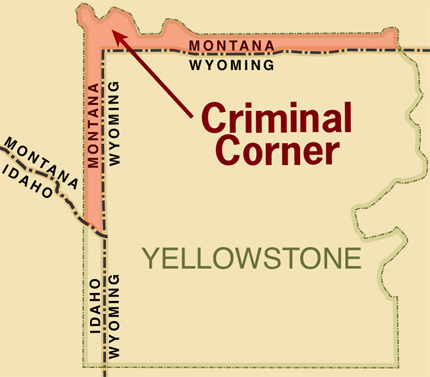 But her geographic illiteracy was on full display last week when she was interviewed by a Montana radio station. 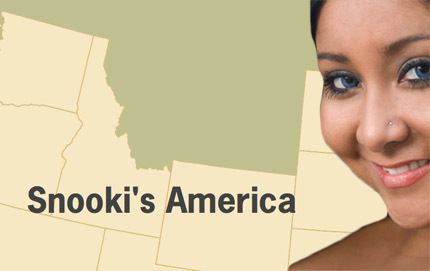 Snooki asked, "Where is Montana? Is that a state?" That gives me an idea for next season... send Snooki and company to Montana... let 'em work on a ranch... get bucked off a bronco... step in buffalo dung. Now that would be entertaining. Now that Rick Perry is officially in the presidential race, I wish he'd clarify his statement about secession. He might be a great potential president; he might be a lousy one—I have no way of knowing. But I do know that the jury is still out on his command of American history and geography. The right to split into multiple states is explicitly true for Texas, although it's also true for any state. While Texas has never split, Massachusetts has—creating Maine. 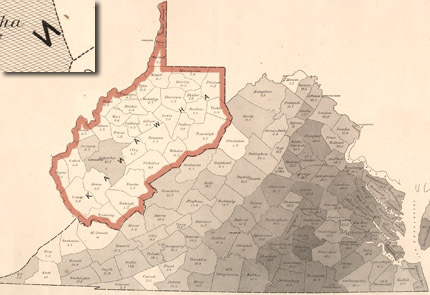 Virginia also split, creating West Virginia. But the topic of secession (that is, leaving the US) is more tricky. The last time any state tried it, a civil war was triggered, and we all know how that turned out. That said, historians and scholars like Thomas Woods point out that secession isn't actually unconstitutional. The whole thing is a lot more nuanced than you learned in elementary school. Rick Perry might actually have a command of this stuff... or he might have it all wrong. It's not clear just yet which one that is. Garden of Eden - located! But what about the Garden of Eden? Most Christians believe it was a real place, but unlike Jerusalem or Rome, its ancient location is not obvious. Yet the Bible does offer a surprisingly detailed description of the Garden of Eden's location. The problem has always been that that researchers could not find two of the rivers mentioned in the Biblical description. Modern hydrological sciences have recently solved that problem, giving scientists all the data necessary to triangluate the Garden of Eden. But the data didn't add up. Until recently, that is—when Phd hydrologist Ward Sanford offered an elegant solution. You can read his full report here (scroll down for the details). But first, watch our video above to find out where the Garden of Eden likely was (or is). The National Geographic Society should know better. I've always been a little frustrated that their yellow-bordered National Geographic magazine seems to focus more on sharks and bears—and less on actual geography. Today, for example, their home page features robots playing soccer. How is that geography, exactly? I mean, if they had a real focus on maps and geography, they never would have used the photo above to promote their "National Geographic World Championship. "(It's kind of like a geography bee). Of course, no disrespect to Pranav Bhandarkar, Stefan Petrovic´, or Anthony Cheng who are all admirable young participants. The issue is the map. Regular readers will see the blunder right away. Here's a hint: the World Championship took place just a few days ago... in late July. 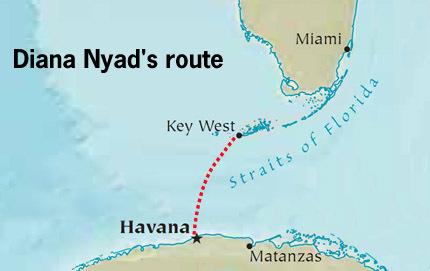 This morning, Diana Nyad had to end her quest to swim the 103 miles from Cuba to the United States. She made it half way, which is nothing to sneeze at. Still, what was Nyad trying to prove? She claims the purpose of the swim was to demonstrate the youthfulness of people in the 60+ age group. I guess. But don't we already know that? Two words: Helen Mirren. 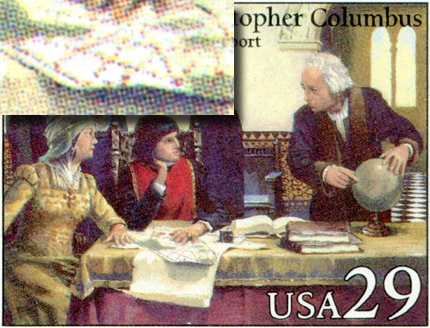 Yesterday we posed the question: What's the geography goof on the 1993 Columbus stamp? I must say I had the same question as reader Phil, who wondered about possible lines of latitude and longitude on the map that's laying in front of Isabella. So I blew up the image (upper left), revealing that the lines are not parallel, so that's not really a mistake. At least I don't think so. And, like reader Enigma149, I did see Florida on the map—which Columbus would not have known. But, in fairness, that's probably more of Rorschach blot. The big error, (as readers Ken, tkrausse, and kzimman noted) was the globe. Yes, most smart people in 1492 knew the world was round, but there was just one globe in existence (as far as historians can tell), and it never left Germany. And that globe wasn't a tabletop model—it was a much bigger, floor-standing unit. So that's the most serious error in the stamp above. But there is one more thing... as best we know, Columbus was 41 when he made the pitch to Isabella. Does the guy in the stamp look 41 to you? That's the same age Vince Vaughn is now... and Jack Black. Ah, there's a high-concept movie idea: Jack Black as Christopher Columbus. This 1992 US stamp has a significant geography goof. 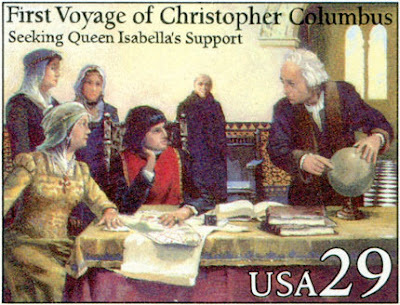 It's supposed to show Columbus pitching Isabella on the idea of a westward journey across the Atlantic. But one thing in this scene is all wrong. By the time historians caught it, the stamp was already in circulation—and it was never changed. To view it more closely, I've posted a much bigger version here. Take your guesses... the answer tomorrow! Should the state of Tennessee sell naming rights as a way to make money? The idea was floated the other day by Knoxville humorist Scott McNutt. Of course, McNutt was making a joke, but one major city actually did sell off naming rights to large corporation. And it retains the company name to this day. (More on this here and here.) Anyway, McNutt suggested selling Tennessee's naming rights to Pilot/Flying J... but I think that one of Tennessee's bigger employers would be a more natural fit. How about "Fedexessee"? It kind of rolls off the tongue nicely. Of course, the state flag would have to be updated to purple and orange. Got a better idea? Add your suggestions. Grant County, Oregon voted to declare itself a "United Nations-Free Zone" over concerns that the UN has plans to send in the black helicopter fleet, confiscate everyone's guns, and and enslave the local children (oh, wait, that last part's from TNT's new series Falling Skies). 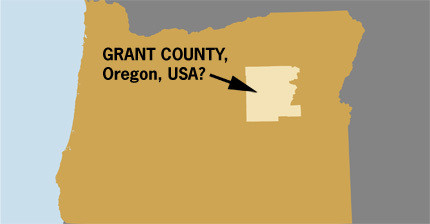 The fact that Grant county wants to separate itself from the rest of the USA isn't all that unusual, but it seems that no one there gets the irony. You see, Grant county is named for Ulysses S. Grant. 150 years ago, when another group of citizens didn't like what the government was doing, Ulysses Grant led the army that put a stop to the uprising. 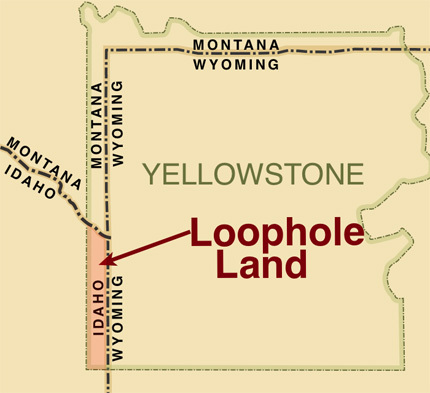 It's kinda like Bourbon county, Kansas—where bourbon is illegal. It's funny... and the irony makes it hard to take them too seriously. So maybe the first step Grant County should take is to change its name.... maybe rename itself after some famous statesman who was against the United Nations. I can see the sign now, "Welcome to Charles de Gaulle county, Oregon."